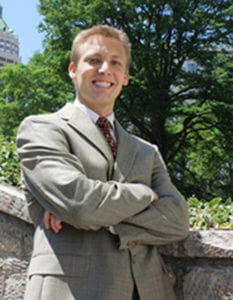 Burke Marold (J.D., MBA ’11) is a young, entrepreneurial attorney full of ideas and plans for the future. He is taking it upon himself to stimulate corporate philanthropy in the legal community, and he intends to do it leading After passing the bar, Marold set off to open his own law practice. He rented an office in San Antonio’s Tower Life Building, a prime downtown locale. He drew up plans for how he would make his living and treat his clients, including donating 10 percent of his net revenue every year to charity and building a culture of community service. Not everyone was on board with his plan, though. Marold’s father felt the economy was too tough and worried his son’s student loan debt might stop him from being able to give back 10 percent, especially as a first-year practitioner. What he didn’t want was for his philanthropic plan to be seen as hollow words. Since opening his firm in November, Marold has gathered a team of volunteers to fight graffiti once a month. He decided that the biggest impact he could have was in his own neighborhood: the Gateway District bordering St. Mary’s University. He appreciated the Neighborhood Revitalization Project that St. Mary’s champions, but noticed that graffiti was tarnishing everyone’s hard work. Partnering with the city of San Antonio’s Graffiti Abatement Program, which provides supplies of paints, chemical peels and tools, he outfitted his volunteers (groups of five to 60) who then took off on foot along Bandera Road, working the neighborhood from Hillcrest to Cincinnati Avenue. “The act of doing is most important. Get over the fear of ‘what-if no one comes’ and just do it,” said Marold. “At the end of the day, even if it is just you, that’s great. You have still accomplished something rewarding and constructive and productive. I enjoy it every time; I love the camaraderie between volunteers. In San Antonio, he has been a member of Big Brothers, Big Sisters since 2007 and supports various other causes. But graffiti abatement has become his main focus as he sees the effect it can have on neighborhoods attracting new homeowners and businesses, as well as growing tourism and the economy. In an effort to have an even wider reach, Marold has collaborated with the Texas Juvenile Justice Department leading groups of young people on graffiti cleanups around the city. “I think the Graffiti Abatement Program provides the youth a rich opportunity to give back to the community in a positive way,” said Donna Garrett, community relations coordinator with the Texas Juvenile Justice Department. Marold lived in Illinois, Hawaii and California before moving to Texas with his family. But he says that of all the places he’s lived, he has an affinity for San Antonio. He credits the St. Mary’s MBA core curriculum and law school for giving him the foundation to build a successful career and providing validation for his public service goals. “Those who have been given chances in life should give chances to others,” he added. This article originally appeared in the Summer 2012 issue of Gold & Blue magazine.